Printing photos doesn't have to be hard. With Aperture in particular, you can print excellent images with minimal effort. That's not to say that you can't tweak settings further to achieve the utmost quality. But for the bulk of my output, I use this easy-to-follow system and throughly enjoy what I've seen emerge from my Epson Stylus R2000 photo printer. 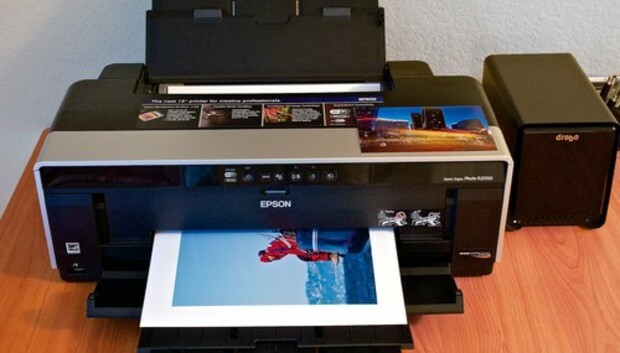 The following steps will work with current Epson photo printers and can be easily adapted to Canon models, too. The workflow is based on the improvements that these manufacturers have made to their printer software. So if you haven't fired up your inkjet printer lately because printing with it has been too frustrating, consider giving it another shot. When it's time to print, you want quick access to your best stuff. That's one of the reasons I'm a big fan of using star ratings. Peruse your highly rated images and choose one that you would consider hanging on the wall. If you're printing 13 by 19 inches as I am for this article, then I recommend that you work with a 16-megapixel image or larger. If you have 4900 pixels on the longest side of your picture, then you should be in good shape. Pictures of more than 5000 pixels on the longest side are welcome if you have them. Before a printing session, I always check the Display Profile for my MacBook Pro's 15-inch Retina display (launch System Preferences and choose Displays > Color). I have a few special profiles I've created for other purposes, but for printing I use the default Color LCD. If you're having a problem with accurate on-screen color, you may want to try a calibration unit for your computer. Just make sure it's compatible the type of screen you have. For my Retina display Mac, the Color LCD profile works just fine. Next, I go back to Aperture and enable onscreen proofing (View > Onscreen Proofing) and choose the appropriate Proofing Profile for the inkjet paper I'm using. Finally, I set the brightness for my display about two notches below full brightness. Why do I do that? Well, the MacBook Pro display is backlit and very luminescent. The print I'm about to make will be viewed with reflective light, which is much different. Dropping my screen brightness a notch or two helps me bridge the gap between backlit and reflective art. Now it's time to print! Choose Print Image from the File menu and click the More Options button in the lower left corner. By doing so, you'll have the tools you need to fine-tune your output. At the top of the dialog box are a handful of presets. Choose Standard for your first image. In the Printer pane below the presets, choose your printer and the paper size you wish to use. For the first image, I'll print borderless, I'm choosing 13 x 19 Sheet Feeder Borderless. The paper size depends on the kind of output the printer supports, so not every printer will have the same options. In the next pane, Layout, set the orientation and image size. You can choose the specific paper size from the pop-up menu, or go with Maximum to Fit, as I did here. Once you have the basics in place, jump down to the Rendering pane. Here's one of the most important changes with modern inkjet printers: You can choose Printer Managed from the Color Profile pop-up menu. In the past I had to work with ICC profiles. But the current Epson technology has made this part of the process much easier. And since I know I have a big enough file for this output (thanks to my 16-megapixel image), I can choose Auto from the Print Resolution pop-up menu. Now click the Print button. Aperture will prepare the job and hand it off to your printer. We're not done quite yet. The Epson will have a few more questions, so it presents its own print dialog box. The only area I really concern myself with is thr Printer Settings pop-up menu in the middle of the dialog box. Select the type of paper that's loaded in the printer via the Media Type pop-up, choose color, or as in my case, AccuPhoto HG, for print mode. In the Color Mode pop-up menu, I go with Epson Vivid, but you also have the option for sRGB or Adobe RGB. Generally speaking, you will also get very good results with Adobe RGB. I recommend choosing Best Photo from the Output Resolution pop-up and turning off High Speed for the final print (however, I often use it with the first print and can't really tell a substantial difference in quality). The click the Print button. More than half the time, the first image that emerges from the printer is good, and I stop right there. If I do need to make a few small adjustments, however, I can using the Image Adjustments pane. The sliders here for Brightness, Contrast, Saturation, and Sharpen affect only the print job, not the original image itself. Once I find the correct adjustments, I can save these settings by clicking the gear menu at the bottom of the dialog box and selecting Duplicate Preset. Give your new preset a descriptive name so you'll recognize it when you return. I'll conclude our printing exercise with a tip. One of my favorite tricks is to set extra-wide margins, such as 1.5 inches. This will float your photo in the center of the paper, giving it a classy art gallery appearance, but without your having to cut mats.